• If you travel over a wide range of terrain and surfaces. • If your height ranges from 5'2" to 6'6"
If you're someone who loves the outdoors, craves an active lifestyle or likes to travel over a wide range of terrain, you might want to give deeper consideration to a heavy-duty mobility scooter, often called an "all-terrain mobility scooter." While it might sound like an all-terrain mobility scooter sacrifices comfort for safety and durability, the reality could not be further from the truth. 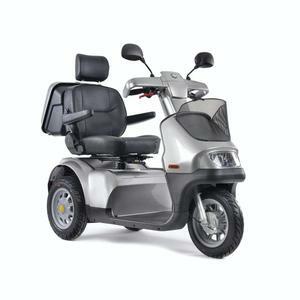 Many all-terrain mobility scooters come with deluxe reclining seats, headrests, arm rests, sliders to adjust the seat and an adjustable tiller to rest your hands and wrists. Some models feature captain's chairs. • Longer miles per charge, typically 20 to 45 miles per charge, compared to 10 to 25 miles per charge for a full-size mobility scooter or 7 to 15 miles per charge for a travel scooter. • Higher maximum speeds, usually speeds of 5 to 10 miles per hour, compared to 5 to 7 miles per hour for full-size mobility scooters and 3 to 5 miles per hour for travel mobility scooters. • Larger wheels and higher ground clearance to traverse almost any terrain. • Wider wheel base and turning radius for increased stability on rough and uneven surfaces, and a turning radius of up to 82.5 inches depending on the model. • Heavy-duty suspension and reinforced frame, including reinforced frames that are built on suspension systems that specifically are designed to provide a smooth and comfortable ride regardless of terrain. • Higher-weight capacities, which accommodate heavier loads and provide comfort to larger individuals, sometimes up to 400 or 500 pounds, without sacrificing safety and comfort. • No assembly or disassembly required, because most all-terrain scooters do not disassemble and are quite large for outdoor use. • Options to take on the road, as many fit on a vehicle lift to be taken on trips and getaways. Those that do not fit on a vehicle lift generally are best for someone who lives on a farm, a large piece of land or in a community where outside riding is the norm. • Outdoor accessories and other add-ons, such as longer life batteries, cylinder tank carrier, armrest bag, scooter trailer, cup holders, saddlebags, rear basket, rearview mirror and more, all with the goal of making the riding experience as enjoyable and safe as possible. Even though they are designed and built for rugged and heavy-duty use, all-terrain mobility scooters are great for trips to the grocery store or through the neighborhood. 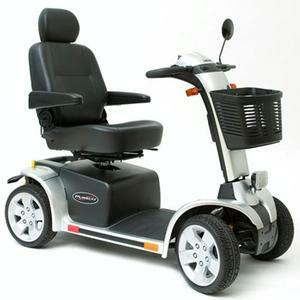 It's all about providing you with a mobility scooter that fits all aspects of your life.